With his next fight just a few days away, Dustin Poirier still can’t explain why he’s facing Anthony Pettis rather than Eddie Alvarez. 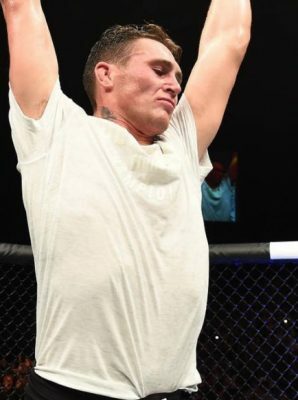 Poirier fought Alvarez earlier this year in a battle that ended in a no contest after several illegal strikes were landed and the American Top Team fighter was not allowed to continue. Poirier believed that Alvarez should have been disqualified after he was nailed with a pair of illegal knees but regardless of anything else, he just wanted his chance to finish what he started with the former lightweight champion. So it was to his surprise when the UFC announced that Alvarez was going to be coaching the new season of “The Ultimate Fighter” while he was face Pettis in a main event at UFC Fight Night in Virginia this weekend. Of course, Poirier never turns down a fight and he’s happy to face another former champion in Pettis, but he still can’t explain why the UFC failed to offer him the rematch with Alvarez considering the way their last matchup played out. “I wish I could tell you something but I’m not the matchmaker. That’s the fight I wanted but now we’re focused on Pettis obviously,” Poirier told the Fight Society podcast this week. Of course, Poirier doesn’t look at his fight with Pettis as any sort of consolation prize because in many ways this might be an even more high profile matchup. Pettis is a former UFC and WEC lightweight champion, who just recently contender for another title at 145 pounds as well. Add to that, Pettis carries a lot of name value as he’s crossed over into the mainstream several times during his career, which makes the spotlight on this fight even brighter. “Going from fighting one world champion to fighting another is a great place to be, showing that I’m at that level with the top guys in the world,” Poirier said. “I’ve got a lot of respect for Anthony Pettis, we’ve been fighting on a lot of the same cards all over the world for a lot of years now both coming from the WEC. He’s been to the mountaintop. That being said, Poirier hasn’t forgotten about Alvarez or the bitter taste left in his mouth after the way their last fight ended earlier this year. While he’s got business with Pettis this weekend and Alvarez is set to face Justin Gaethje in December, Poirier knows that they are going to cross paths again at some point in the future. Listen to Poirier’s interview as well as Duane “Bang” Ludwig and Joe Lauzon on the latest Fight Society podcast. Download and subscribe to the show via Apple Podcasts as well.